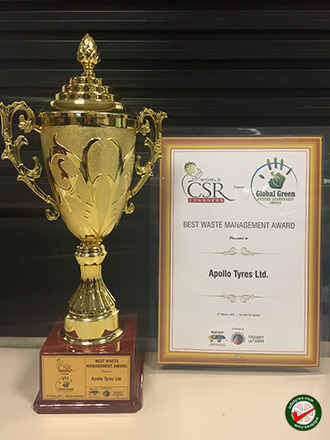 Awarded under Best Waste Management category Apollo Tyres, the leading tyre manufacturer, was recently awarded with the Global Green Future Leadership Award 2016 by World CSR Congress. The company received this award under the Best Waste Management category for its Clean My Transport Nagar (CMTN) initiative in the transshipment hubs across the country. Starting with Sanjay Gandhi Transport Nagar in Delhi, in 2012, company’s CMTN initiative is currently running in the transshipment hubs of Agra, Jaipur, Jodhpur, Kanpur and Mumbai, in addition to Delhi. Aimed at bringing together various stakeholders within the community and understanding the challenges faced by them, this initiative of Apollo Tyres strives to improve the waste management collection scenario and reduction in open dumping, improve overall cleanliness of the transport nagars (transshipment hubs) and make them greener. In addition, it also aims to generate awareness amongst truck drivers, mechanics, shopkeepers and rag pickers, on the importance of hygiene, sanitation and keeping their surroundings clean and green. Under the CMTN initiative, the company has collected nearly 40,000 kgs of biodegradable waste, and 16000 kgs of non biodegradable waste. In addition, around 1600 kgs of compost has been produced, which is being used for maintaining the greenery of nearby parks. The Global Green Future Leadership Awards are presented to organisations that participates in environment friendly or green activities to ensure that all processes, products and manufacturing activities of that organisation adequately addresses current environmental concerns.